There is a growing concern for round the clock repairing of doors as there aren’t many 24 hour repair companies. 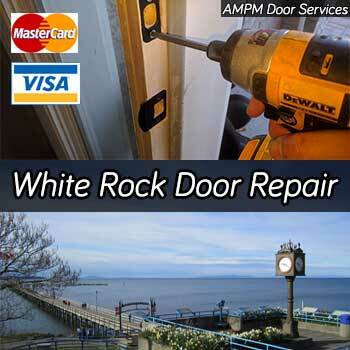 This is where we excel, as we provide 24 hour emergency door repair services to all areas of White Rock. We will arrive with the required components to fix your door at a moment’s notice. One of the pressing issues such as door repairs after break ins. Give us a call and we will set it right which will allow you to be at peace. White Rock is mainly a residential area hence the properties that are present were built some time ago. The residential areas in White Rock may face decay as the doors age in time. We provide services in these areas and are able to work on not only exterior but also the interior doors and frames. This is important as there are different methods in fixing the two varieties of doors. We can even be of assistance if you need some extra security and need to change your locks. If your lock is broken, we could also repair the existing one. While we do pay special attention to residential door repairs, we also have a keen interest in the commercial properties as well. We repair both steel and wooden doors as well as the aluminum and glass doors. One of the most important areas in a commercial property is the storefront and entry doors. We will repair any damage that may have been caused an out it in good shape. Repairing of these doors need to be done with special care which is why we want you to contact us if the need arises. While repairing residential and commercial doors are one of the main concerns at 24hr Door Repair, we also tend to the more exotic sliding patio doors that are present. A sliding door is unique in the way it has been built and how it should be repaired. We have the required expertise and skill to do just that. We will repair the door together with any and all damaged rollers and tracks. The railing could also be the reason why it is not functioning properly which is why we will aid in this regard as well. We could even repair the door handle and the locks if needed. In essence, if there is any requirement in order to repair a door or its components, contact us at any time.